Sudoku Puzzles and Printable Puzzles are the one which I started publishing on this blog. It was later I included Fun Brain Teasers, Maths Puzzles, Logical Puzzles and Observational Brain Teasers here. There are many different sets under which these Sudoku puzzles are being published. e.g there are different Sudoku Series for which I used to publish Sudoku puzzles. Also there are many different Sudoku events for which different authors has written about their experience. Also there are tutorials related to the Sudoku solving. Here I am listing links to these post which are related to Sudoku puzzles. Do click on the links given to open the corresponding Sudoku posts. The League of Extraordinary Ladies & Gentlemen: This is also known as Daily Sudoku League. In this Sudoku League best authors in world used to submit one puzzle every week. I have contributed more than 200 Sudoku puzzles for this league. Sudoku puzzles published under this series are tough and created for experienced Sudoku players. Do checkout these puzzles and let me know your feedback. Fun With Sudoku Series: Other than Daily Sudoku League, I was contributing to Fun With Sudoku Series. Sudoku puzzles published under this series are not very tough and anyone playing Sudoku regularly can try these Sudoku puzzles. Do checkout more than 200 Sudoku puzzles published under series. Mini Sudoku Series: This Sudoku Series contained small sized 6x6 Sudoku puzzles for kids. This series is also designed for someone who is new to Sudoku solving and want to know about different Sudoku types. 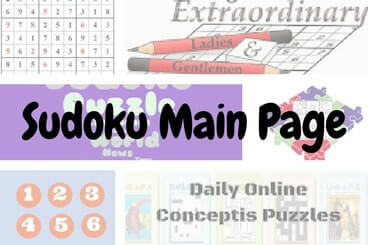 Do checkout more than 100 Sudoku puzzles published under Mini Sudoku Series. Logical Puzzles and Sudoku Tutorials: Anyone solving Sudoku puzzles first time will be looking forward to the Sudoku puzzle tutorials. This page lists link to the Logical Puzzles and Sudoku tutorials. Daily Online Conceptis Puzzles: Website Conceptis Puzzles publishes many different puzzles daily. This includes Classic Sudoku and some of very well know Sudoku variations. Checkout this page to solve all these puzzles online on the single page. Sudoku Variations Main Page: Link Classic Sudoku there are many different standard Sudoku Variations. Checkout this page for the links to the many different printable Sudoku Puzzle Variations. Good Puzzles/Sudoku websites: Fun With Puzzles is not the only website which is publishing Sudoku and Puzzles regularly :). There are many different puzzles and Sudoku website which are regularly updated and provides many different puzzles to be solved online and offline. Do check this page for the names and links to these websites. Quixy Challenge Puzzles: More than 10 years back Hendrik Hardeman published Quixy Challenge Puzzles every week. These puzzles were designed so that anyone unknown to any puzzle variation can quickly understand the puzzle rules and then there are 3 puzzles in each sheet of increasing difficultly. There are more than 57 puzzles types covered in this series along with some Sudoku variations. Puzzle & Sudoku Events: There are many different Sudoku and Puzzle Events going on every year. This post links to all the pages where different authors has described their experience participating in these championships. Also this post links to some of the photographs and news related to Sudoku and Puzzle events. Sudoku and Puzzles Championships: There are every week one of the another Sudoku or Puzzle Championships which you can participate online sitting in your home. Earlier we used to post about these championships. However now a days we have stopped this practice. You can look at the links of these Championships at Puzzles Championships before 2012 which list Puzzles and Sudoku Championships which took place till the end of 2011. Also you can look at Puzzles Championships after 2012 which lists the Sudoku and Puzzle Championships after year 2012.